Did the Fed Cause the Shale Bubble? What If We Just Need Fewer Jobs? Lacy Hunt and I were talking yesterday about Texas and the oil industry. We have both lived through five periods of boom and bust, although I can only really remember three. This is a movie we’ve seen before, and we know how it ends. Texas Gov. Rick Perry has remarkable timing, slipping out the door to let new governor Greg Abbott to take over just in time to oversee rising unemployment in Texas. The good news for the rest of the country is that in prior Texas recessions the rest of the country has not been dragged down. But energy is not just a Texas and Louisiana story anymore. 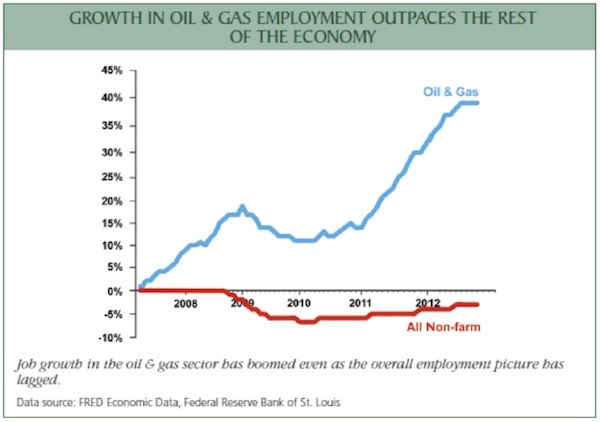 I will be looking for research as to how much energy development has contributed to growth and employment in the US. Then the research began to trickle in, and over the last few days there has been a flood. As we will see, energy production has been the main driver of growth in the US economy for the last five years. But changing demographics suggest that we might not need the job-creation machine of energy production as much in the future to ensure overall employment growth. But first, a quick recommendation. I regularly interact with all the editors of our Mauldin Economics publications, but the subscription service I am most personally involved with is Over My Shoulder. It is actually very popular (judging from the really high renewal rates), and I probably should mention it more often. Basically, I generally post somewhere between five and ten articles, reports, research pieces, essays, etc., each week to Over My Shoulder. They are sent directly to subscribers in PDF form, along with my comments on the pieces; and of course they’re posted to a subscribers-only section of our website. These articles are gleaned from the hundreds of items I read each week – they’re the ones I feel are most important for those of us who are trying to understand the economy. Often they are from private or subscription sources that I have permission to share occasionally with my readers. This is not the typical linkfest where some blogger throws up 10 or 20 links every day from Bloomberg, the Wall Street Journal, newspapers, and a few research houses without really curating the material, hoping you will click to the webpage and make them a few pennies for their ads. I post only what I think is worth your time. Sometimes I go several days without any posts, and then there will be four or five in a few days. I don’t feel the need to post something every day if I’m not reading anything worth your time. Over My Shoulder is like having me as your personal information assistant, finding you the articles that you should be reading – but I’m an assistant with access to hundreds of thousands of dollars of research and 30 years of training in sorting it all out. It’s like having an expert filter for the overwhelming flow of information that’s out there, helping you focus on what is most important. Frankly, I think the quality of my research has improved over the last couple years precisely because I now have Worth Wray performing the same service for me as I do for Over My Shoulder subscribers. Having Worth on your team is many multiples more expensive than an Over My Shoulder subscription, but it is one of the best investments I’ve ever made. And our combined efforts and insights make Over My Shoulder a great bargain for you. For the next three weeks, I’m going to change our Over My Shoulder process a bit. Both Worth and I are going to post the most relevant pieces we read as we put together our 2015 forecasts. This time of year there is an onslaught of forecasts and research, and we go through a ton of it. You will literally get to look “over my shoulder” at the research Worth and I will be thinking through as we develop our forecasts, and you will have a better basis for your own analysis of your portfolios and businesses for 2015. And the best part of it is that Over My Shoulder is relatively cheap. My partners are wanting me to raise the price, and we may do that at some time, but for right now it will stay at $39 a quarter or $149 a year. If you are already a subscriber or if you subscribe in the next few days, I will hold that price for you for at least another three years. I just noticed on the order form (I should check these things more often) that my partners have included a 90-day, 100% money-back guarantee. I don’t remember making that offer when I launched the service, so this is my own version of Internet Monday. You can learn more and sign up for Over My Shoulder right here. And now to our regularly scheduled program. I had the pleasure recently of having lunch with longtime Maine fishing buddy Harvey Rosenblum, the long-serving but recently retired chief economist of the Dallas Federal Reserve. Like me, he has lived through multiple oil cycles here in Texas. He really understands the impact of oil on the Texas and US economies. He pointed me to two important sources of data. 1. In recent years, America’s oil & gas boom has added $300–$400 billion annually to the economy – without this contribution, GDP growth would have been negative and the nation would have continued to be in recession. 3. The shale oil & gas revolution has been the nation’s biggest single creator of solid, middle-class jobs – throughout the economy, from construction to services to information technology. 4. Overall, nearly 1 million Americans work directly in the oil & gas industry, and a total of 10 million jobs are associated with that industry. Oil & gas jobs are widely geographically dispersed and have already had a significant impact in more than a dozen states: 16 states have more than 150,000 jobs directly in the oil & gas sector and hundreds of thousands more jobs due to growth in that sector. The important takeaway is that, without new energy production, post-recession US growth would have looked more like Europe’s – tepid, to say the least. Job growth would have barely budged over the last five years. 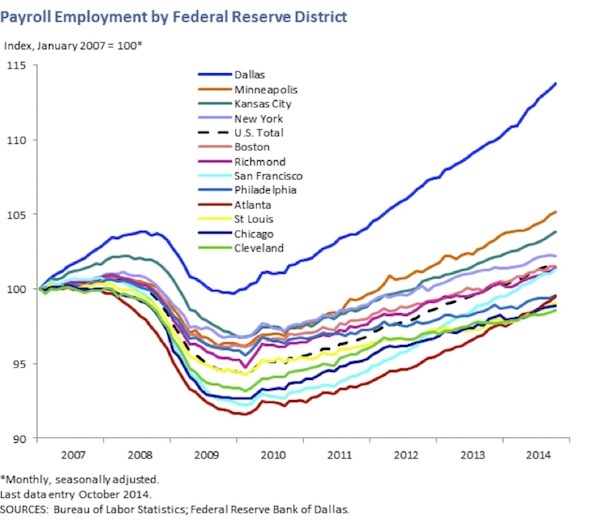 To get the total picture, let’s go to the St. Louis Federal Reserve FRED database and look at the same employment numbers – but for the whole country. 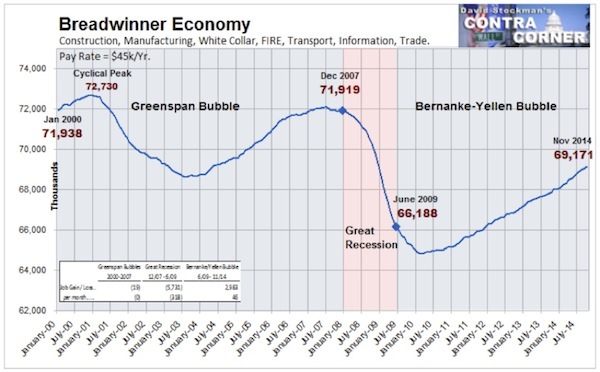 Notice that we’re up fewer than two million jobs since the beginning of the Great Recession. That’s a growth of fewer than two million jobs in eight years when the population was growing at multiples of that amount. Houston, we have a problem. With a third of S&P 500 capital expenditure due from the imploding energy sector (and with over 20% of the high-yield market dominated by these names), paying attention to any inflection point in the US oil-producers is critical as they have been gung-ho “unequivocally good” expanders even as oil prices began to fall. So, when Reuters reports a drop of almost 40 percent in new well permits issued across the United States in November, even the Fed's Stan Fischer might start to question [whether] his [belief that] lower oil prices are "a phenomenon that’s making everybody better off" may warrant a rethink. Consider: lower oil prices unequivocally “make everyone better off.” Right? Wrong. First: new oil well permits collapse 40% in November; why is this an issue? 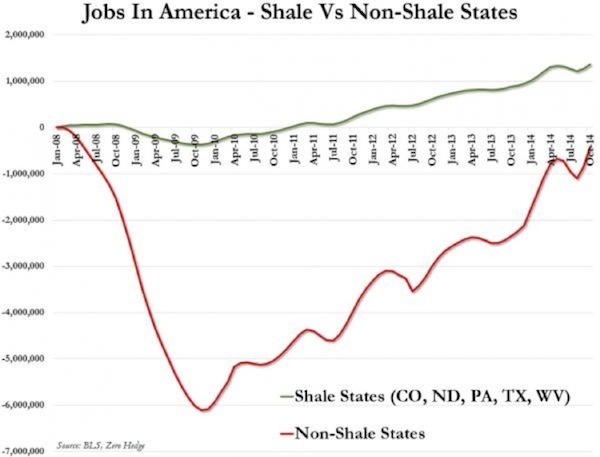 Because since December 2007, or roughly the start of the global depression, shale oil states have added 1.36 million jobs while non-shale states have lost 424,000 jobs. So, is [Fed Vice-Chairman] Stan Fischer's “not very worried” remark about to become the new Ben “subprime contained” Bernanke of the last crisis? Next let’s turn to David Stockman (who I think writes even more than I do). He took aim at the Federal Reserve, which he accuses of creating the recent “shale bubble” just as it did the housing bubble, by keeping interest rates too low and forcing investors to reach for yield. There may be a little truth to that. The reality is that the recent energy boom was financed by $500 billion of credit extended to mostly “subprime” oil companies, who issued what are politely termed high-yield bonds – to the point that 20% of the high-yield market is now energy-production-related. Sidebar: this is not quite the same problem as subprime loans were, for two reasons: first, the subprime loans were many times larger in total, and many of them were fraudulently misrepresented. Second, many of those loans were what one could characterize as “covenant light,” which means the borrowers can extend the loan, pay back in kind, or change the terms if they run into financial difficulty. So this energy-related high-yield problem is going to take a lot more time than the subprime crisis did to actually manifest, and there will not be immediate foreclosures. But it already clear that the problem is going to continue to negatively (and perhaps severely) impact the high-yield bond market. Once the problems in energy loans to many small companies become evident, prospective borrowers might start looking at the terms that the rest of the junk-bond market gets, which are just as egregious, so they might not like what they see. We clearly did not learn any lessons in 2005 to 2007 and have repeated the same mistakes in the junk-bond market today. If you lose your money this time, you probably deserve to lose it. The high-yield shake-out, by the way, is going to make it far more difficult to raise money for energy production in the future, when the price of oil will inevitably rise again. The Saudis know exactly what they’re doing. But the current contretemps in the energy world is going to have implications for the rest of the leveraged markets. “Our biggest worry is the end of the liquidity cycle. The Fed is done. The reach for yield that we have seen since 2009 is going into reverse,” says Bank of America (source: The Telegraph). Contained within Stockman’s analysis is some very interesting work on the nature of employment in the post-recession US economy. First, in the nonfarm business sector, the total hours of all persons working is still below that of 2007, even though we nominally have almost two million more jobs. Then David gives us two charts that illustrate the nature of the jobs we are creating (a topic I’ve discussed more than once in this letter). It’s nice to have somebody do the actual work for you. The first chart shows what he calls “breadwinner jobs,” which are those in manufacturing, information technology, and other white-collar work that have an average pay rate of about $45,000 a year. 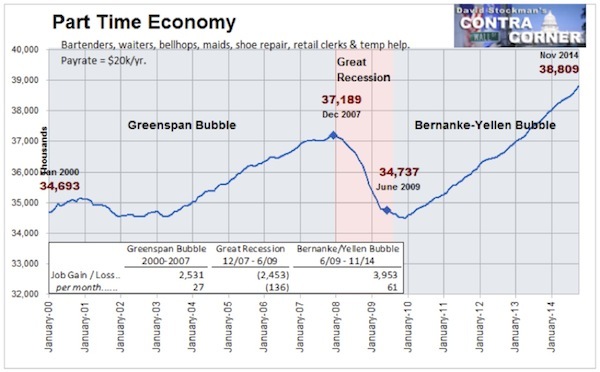 Note that this chart encompasses two economic cycles covering both the Greenspan and Bernanke eras. So where did the increase in jobs come from? From what Stockman calls the “part-time economy.” If I read this chart right and compare it to our earlier chart from the Federal Reserve, it basically demonstrates (and this conclusion is also borne out by the research I’ve presented in the past) that the increase in the number of jobs is almost entirely due to the creation of part-time and low-wage positions – bartenders, waiters, bellhops, maids, cobblers, retail clerks, fast food workers, and temp help. Although there are some professional bartenders and waiters who do in fact make good money, they are the exception rather than the rule. It’s no wonder we are working fewer hours even as we have more jobs. With all that as a backdrop, let us return to our original task, which was to think about what will impact the US and global economies in 2015. I’ve been talking to friends and contacts who are serious players in the energy-production sector. This is my takeaway. The oil-rig count is already dropping, and it will continue to drop as long as oil stays below $60. That said, however, there is the real possibility that oil production in the United States will actually rise in 2015 because of projects already in the works. If you have already spent (or committed to spend) 30 or 40% of the cost of a well, you’re probably going to go ahead and finish that well. There’s enough work in the pipeline (pardon the pun) that drilling and production are not going to fall off a cliff next quarter. But by the close of 2015 we will see a significant reduction in drilling. We must balance this problematic analysis against research that Harvey Rosenblum (whom we met at the top of the letter) and my good friend (and likewise Maine fishing buddy) John Silvia, the chief economist at Wells Fargo, have just produced. John is a very solid economist who has his head on straight (in addition to being a really nice guy). Job growth is a function of both the supply of and demand for labor. With labor force participation having fallen sharply since the Great Recession and growth in the working-age population slowing, growth in the supply of labor, measured by labor force growth, looks to have downshifted in recent years. As a result, the number of new jobs needed each month to keep the unemployment rate steady has also declined. We estimate that from 2015 to 2020, payroll growth of around 65,000 jobs per month should be sufficient to absorb new entrants into the labor force and to exert neutral pressure on the unemployment rate. This marks a notable downshift from a trend of around 150,000 in the 1980s and 1990s, and even the early 2000s when trend employment growth slowed to around 120,000. Harvey and I talked about this research, and while we are probably going to ask John for the spreadsheets and more details as to his basic assumptions, anyone who studies demography knows that a serious falloff in the number of new babies began some 23 years ago. And while I don’t think that Baby Boomers are going to retire following the same patterns that we saw in previous generations, there will certainly be an increase in those who think of themselves as retired, reducing the participation rate. An immediate takeaway from this analysis is that if job growth continues to bump along in the 200,000 range, it will not be too long before there is wage pressure, especially in skilled jobs. That would be good news for workers. If we couple that pressure with a change in the silly rule that says that anyone working more than 30 hours is considered to be full-time and move the number of hours considered to be full-time work to 40 (I think that has a good possibility of passing next year), it will mean that workers (especially those who are younger) get more hours, more income, and better jobs. It will also mean that the unemployment rate will trend down, even if employment growth is not up to historical standards. And let’s make no mistake, it has not been. The euphoria occasioned by the economy adding 321,000 jobs in November indicates that we have defined success down. In the 1960s, there were nine months in which more than 300,000 jobs were added, the last being June 1969, when there were about 117 million fewer Americans than there are now. In the 1980s, job growth exceeded 300,000 in 23 months, the last being November 1988, when there were about 75 million fewer Americans than today. We’re going to stop here before the letter runs too long. Next week we really will get to the global economy and especially the dollar story. We will have to address the very sad question, “Are we really going to have to focus on Greece again?” And while I tend to vigorously disagree with Paul Krugman’s policy analysis and prescriptions, he pretty much gets it right in talking about the problems of Greece in his latest New York Times column “Mad as Hellas.” It is all so very sad. But there’s a reason they’re [protest movements] on the rise. This is what happens when an elite claims the right to rule based on its supposed expertise, its understanding of what must be done – then demonstrates both that it does not, in fact, know what it is doing, and that it is too ideologically rigid to learn from its mistakes. And I totally agree with that statement. I think that’s precisely the lesson we should learn from the 2014 US elections, as well. The irony is that many of us would consider Paul Krugman to be part of that elite. Just saying. I sent you an email last week noting that we have reopened our Mauldin Economics VIP Program. Subscribers get access to all our current editors at a much-reduced rate. It really is the best deal we offer all year, and perhaps you should consider giving yourself a little gift. I am very proud of our team and the analysis we produce. You get Yield Shark, Bull’s Eye Investor, Rational Bear, Just One Trade, and Transformational Technology Alert, all for just $1,745/year, which is a significant discount from their collective $7,679 published retail value. I am home for the rest of the month (with perhaps a quick trip to DC being the one outing), but the calendar for next year is beginning to fill up. I see Cincinnati, Grand Cayman, and Florida on my schedule. It has been a while since I’ve been in the Cayman Islands, and this time I will take a short hop over to Little Cayman to visit my friend Raoul Pal for a few days. A brilliant macroeconomist and trader, Raoul has now based himself in Little Cayman, although he frequently flies to visit clients. He is also a partner with Grant Williams in Real Vision Television, a fascinating new take on internet investment TV. I’ll be writing more about it in the future. On a very personal note, everyone is aware of the “We Can’t Breathe” protests that are taking place in response to a very tragic incident in New York. Reasonable people can disagree on what the response should be or on how to interpret the facts of that particular incident, but it is not difficult for me to understand the frustrations of the African-American community. I have two adopted black sons (now adults) along with my five other children (two of them Asian-American). I can tell you that my experience has been that as teenagers they were far more likely to be pulled over and harassed or arrested for things my white children would have been simply told to stop doing and then sent on their way. For the police it seemed to be a problem for my black sons to drive my car around my (admittedly mostly white) neighborhood. There were clearly double standards, both in some of the public and private schools my children attended. I had to be careful not to put them in certain situations that would cause them frustrations. To pretend there is still not a double standard in our society is to whistle past the graveyard. That said, I don’t want to seem like I’m giving a pass to what is clearly all too often a broken family structure and cultural acceptance of certain inappropriate behaviors among young black men. The frustrations of all parties stem from very real problems. There are no simple answers, and much of the really hard work needs to be done in local communities. The whole racial issue has vastly improved since I was young. Projections are that by 2020 around 10% of people in the US will be biracial. That is expected to grow to 20% by 2050 and is clearly going to change the way that we (and especially our children) interact with each other. I will have my fifth biracial grandchild sometime later this month. I hope the world they grow up in is considerably different from the world I grew up in or even today’s world. But recent events demonstrate that we still have some miles left on the journey to a truly colorblind system. Rather than defending a system that clearly still has issues that need to be dealt with, we need to face the problems and figure out how to make a world we want all of our children to grow up in. And on that note, it’s time to hit the send button. Have a great week. Dec. 17, 2014, 6:32 p.m.
Why all the fuss over dropping oil prices? While our high paying jobs were outsourced to third world countries, no one except workers seem to care. Now the press is making every effort to make the American middle class feel guilty about the temporary drop in gas prices. Why? Because the rich have money invested in oil companies. Notice that the fear is not for the oil-workers who will lose the last high-paying job in their lives. They will simply go the way of all the other Americans who went from high paying fulltime jobs to low paying part-time jobs. Funds have about 12% invested in energy. So what? Even if the energy companies are cut in half, their diversified portfolio will still retain 94% of its value. That’s a lot better than most individual investors did during the last two crashes. Additionally, these could be bargain buying days in oil companies pumping cheap OPEC oil. There is some hypocritical lip service given to the closure of our “alternative” oil energy technology. Where was the red flag warning when “Big Carbon” (oil, gas, and coal) managed to get the national alternative energy budgets reduced as low as 15 million dollars? Please stop the guilt trip. Trying to make Americans feel bad about the last sliver of economic relief is not endearing. Many in the press may feel immune to outsourcing. But please consider that you might be replaced with low wage part-time employees who understand more about your subject matter than you do. This is just a back of the napkin with a leaky pen observation, but, viewing the graph titled “FRED” I wonder if the current slope of job increase is steeper than the pre-2007 job increase slope, enough steeper to bring the jobs totals back to where they might have been without the financial collapse within a year or three? Hurting coutries like Russia and Iran is not a ‘side benefit’ to anybody. Fox News may have convinced you that these countries are our enemies - and current US actions seem designed to make them our enemies. But in the real world neither country is a threat to US interests. Dec. 16, 2014, 9:33 p.m.
As a vice president of marketing in a California based company I witnessed a decline in business effectiveness as good quality jobs were being sent to Texas because a) California regulations were stringent/expensive, and b) Texas paid mighty levels of corporate welfare. To qualify for the Texas state incentives 400 jobs had to be relocated within 24 months. They were not net new to the US economy but they were new to Texas. Unfortunately to meet the deadline many dumb decision were made to relocate roles to Texas including the centralization of advanced analytics to San Antonio (advanced analytics is a strategically valuable function dominated by folks with PhDs in statistics). No one in California was willing to move to Texas and the whole department had to be rebuilt… did I mention that not many people with these skills want to live in Texas (Austin may be the only exception for knowledge workers who are not Texas /mid-south state natives). I would appreciate it you would clarify how many of these “new Jobs” are net new jobs to the US economy and consider the impact on overall productivity of transitioning to jobs to Texas and corporate welfare states. Dec. 16, 2014, 7:35 p.m.
Commentators from the right like John are often quick to snipe at Paul Krugman, but do not typically interact meaningfully with him. John takes his shot at Krugman being part of the problematic “elite.” Meanwhile Krugman historically argues that the ongoing crisis in Greece has been perpetuated by German-centric austerity policy, policy which is not only far from what Krugman proposed, but policy to which, it seems, John himself essentially subscribes! If John’s prescription is to get rid of “elites” like Krugman, in order to further perpetuate austerity policies that have demonstrably assisted in the ruin of countries like Greece, no thanks. Dec. 16, 2014, 1:36 p.m.
You write, “then demonstrates both that it does not, in fact, know what it is doing, and that it is too ideologically rigid to learn from its mistakes. Do you mean to imply that the Republican party is NOT ideologically rigid? Really? Seriously? I frequently enjoy John’s articles. However, I can’t le tthis one pass without comment on two related items. First, John contends that 40% of job creation since June 2009 was energy related. While we can argue about the jobs multiplier, the statstics that we know with certainty from the BLS tell us that TX job growth from 2007 to mid-2009 did not dip the way the rest of the country did. From 2009 to the present, it increased roughly in line with the rest of the country (+9.4% versus +8%). OK increased +5.6% since the trough. So as a direct effect, TX job creation was in line with the rest of the nation since 2009. Second, an excerpt contends that O&G added $3-400B to the economy, and without that GDP growth would be negative. That’s two very different statements, one of which is wrong. O&G didn’t add $3-400B of incremental new money per year. If it had, the sector’s cash flow would be in excess of $2Tr today and employment near 20 MM. It is likely true that the sector’s total contribution to GDP is around $400B today, but that means a 10% growth rate represents about about $40B of nominal GDP growth of some $600B. Its absence wouldn’t turn GDP growth negative.